Mark V ExL Shoulder Bag, manufactured by Hopkins Medical Products, is a first-rate medical equipment bag that has quickly become a favorite amongst clinicians and other healthcare professionals. One of the top reasons that this is a favorite amongst medical professionals is because it is HIPAA compliant, as it features interlocking zippers to secure patient sensitive information. If you demand increased security, you can order this dependable medical equipment bag with a combo lock for enhanced security. Equally important to security is versatility, which is an attractive feature that the Mark V ExL Shoulder Bag offers its users. 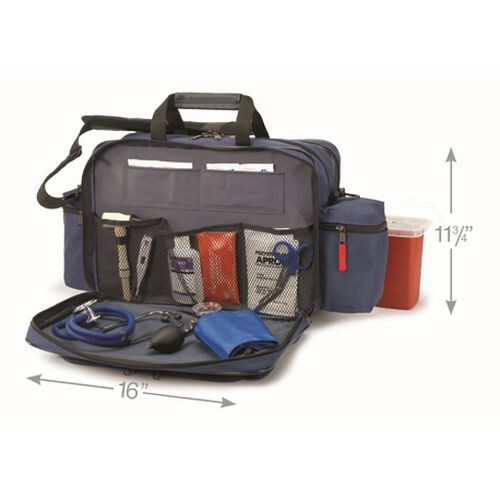 In fact, these nursing bags are equipped with separate compartments for sterile and contaminated equipment, mesh pockets, an executive organizer, and end pouches, which are perfect for carrying pagers or cell phones. In addition to spacious compartments for storage, this medical tote integrates an adjustable and removable shoulder strap for effortless portability. 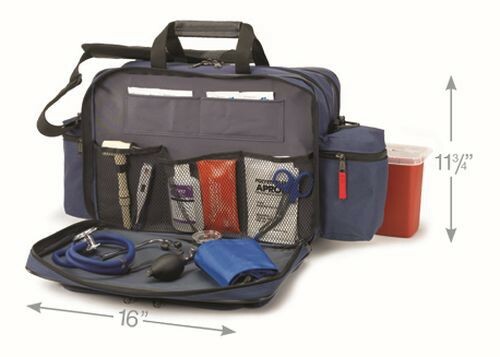 Truly, this innovative bag exceeds the demands of clinicians. Order today and take your practice beyond the ordinary! Executive organize and bag barrier pockets. Fold down compartment that creates a clean work space. Sections for sterile and contaminated equipment. Product Numbers: 530670NVY and 530680. Application: To assist with safely storing diagnostic equipment, among other medical supplies.